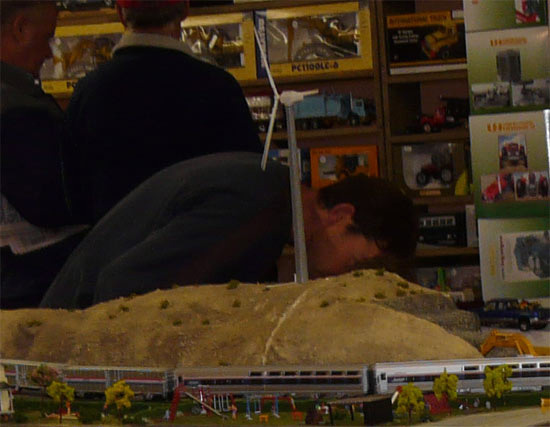 The public attendance at this years Dunedin Model Train Show was was up little from last years attendance to about 3000. The next show will be held around May 2013. 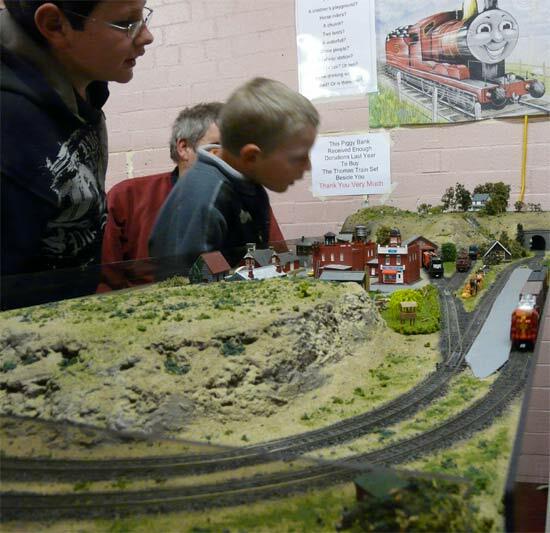 Those that attended enjoyed the layouts that this year were mainly smaller and could be built and operated at home - even by those with small spaces available for train modelling. Attendees to the show could vote for what they thought was the best layout. 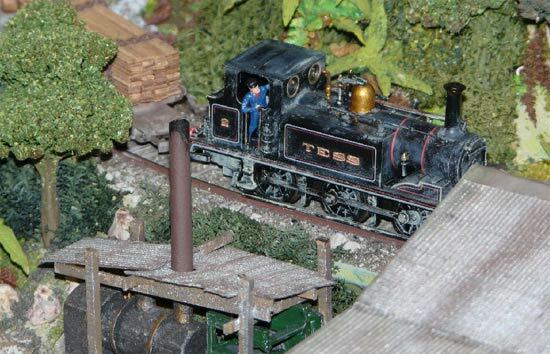 Layout # 1 - The Merrijigs Sawmill which is one of the smallest HO layouts at the show. The first layout encountered at the show was The Merrijigs Sawmill. 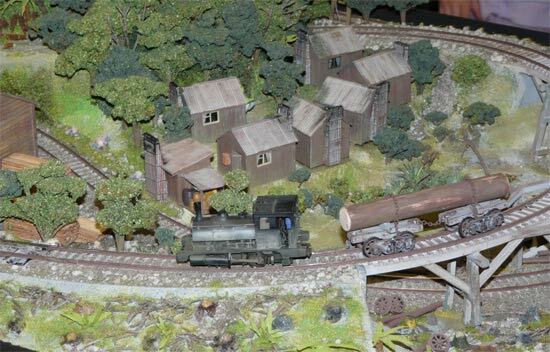 This is a highly detailed model of a South Island steam powered Bush Tram scene, with a working sawmill set deep in the New Zealand West Coast bush circa 1930. ...goes to the nearest railhead for the dispatch of sawn timber and the collection of supplies. A comment from a survey at the show was that this layout brought back memories for a West Coaster. Layout # 2 - Gutenbach is a demonstration layout of Toottoot, a Christchurch Trader. This layout could not be displayed at the 2008 show. 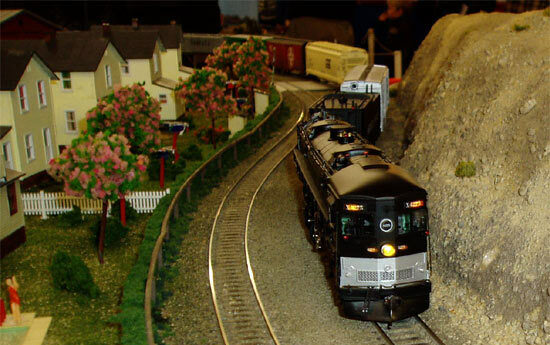 Austinville is a freelance N Gauge layout not based on any particular theme, but represents a small town in a railway setting with a slice of action. Great lighting on the buildings really shows up in this photo. 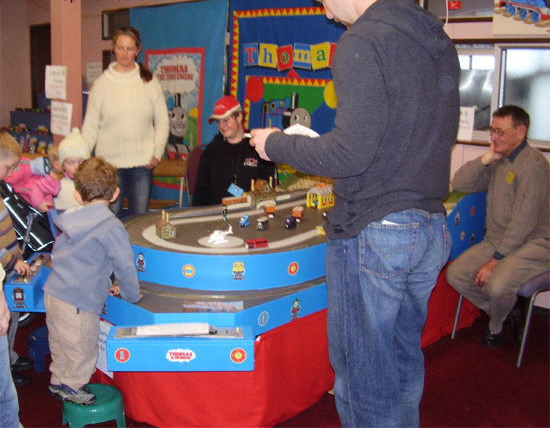 Orsnow was a layout that children could operate, and they certainly enjoyed making the train run back and forth as fast as it could go on the long stretch of track out of the tunnel! 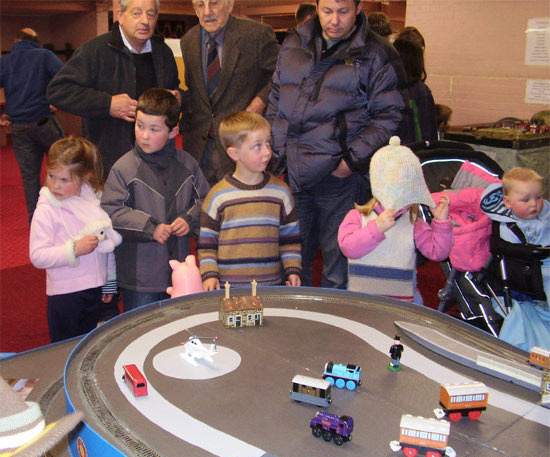 Thomas the Tank Engine and Friends were present, ranging from a large Ertl Thomas display, to a large Thomas and Bertie layout that the children could operate themselves. It comprised of two levels, with Thomas running around the top level with Annie and Clarabel, while Bertie ran around the lower level with the Troublesome Trucks. The upper level controller started smoking on the Sunday afternoon possibly due to the thrashing it was getting and had to be shut down. Both engines were then put on the lower level to chase each other, and that was more amusement for the children and parents. Even those who weren't quite tall enough to see without a little help could get in on the action thanks to stools being available at the door for them to carry round the show. It was great that again this year, as with last year, all stools were returned for other children to use, although several parents were seen coming back from the car park returning stools! The Californian Surfside layout provided onlookers with a slice of life on the Pacific Coast of America. Lucky that ute hadn't pulled any further forward! 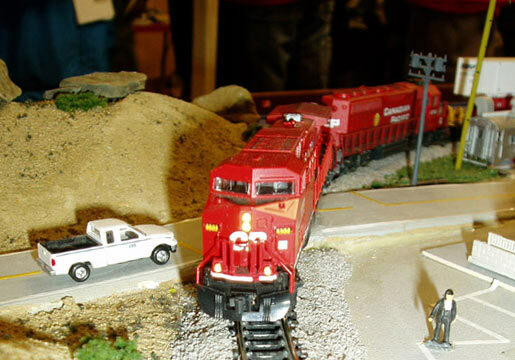 Utah Pacific was the largest HO layout at the show. 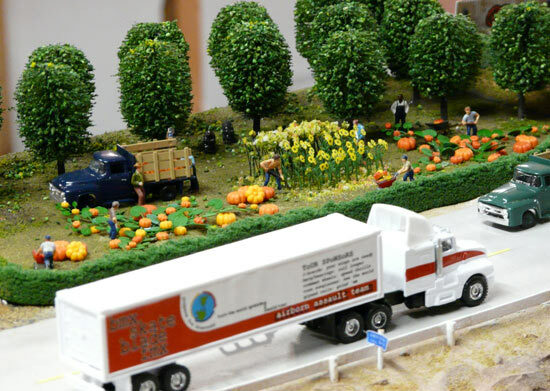 There were three new additions to the layout this year that intrigued the viewer. and an operating wind generator. This layout ran a small steam locomotive which was actively belching smoke, much to the delight of the viewers who were so many at times that the area was jam packed. 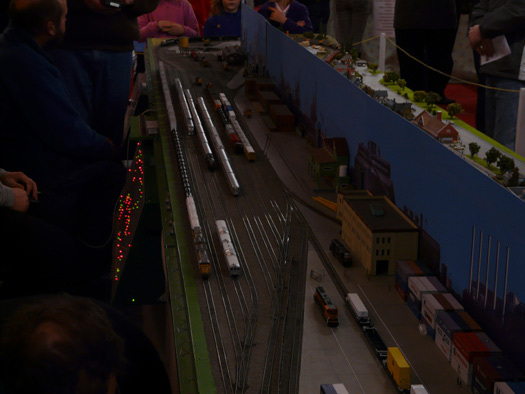 The last layout downstairs was the OMES N scale layout that was viewable on all sides, and had been lowered for easier viewing by children. The lights on the control panel for this layout were a source of fascination for many onlookers and showed visually how complicated model train layouts and operation can get.